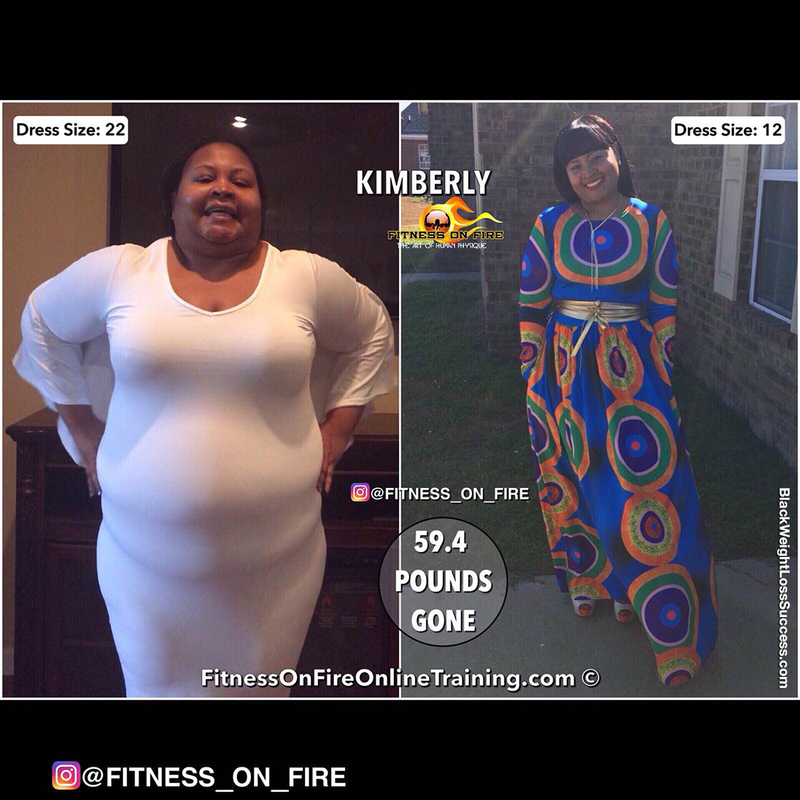 Transformation of the Day: Kimberly lost 60 pounds and has gone from a size 22 to a size 12. After seeing pictures from her husband’s 40th birthday party, she was floored at how I looked and realized she’d been in denial. She let go of her excuses, found the help she needed and focused on exercise and nutrition. Check out her story. My motivation was simple, I just wanted to become healthier. I realized that I had been in denial and that I had gotten out of control with my eating. I needed to make some major life changes. I knew it wouldn’t be easy, but I knew it would be worth it. I had to do this for myself. I thank God for the strength to start and stay on this journey. What inspired you to keep going during the tough times? My main source of inspiration was family, I wanted to be healthy for them. I remember sitting and looking at some pictures from my husband’s 40th birthday party and I was floored with how I looked. I told him that if I didn’t make some changes, I was going to weigh 300 pounds by the end of the year. I realized then that I no longer had time for excuses. I began to view food differently and I realized for every unhealthy option there was a healthy option. Through this journey I also realized that I was an emotional eater and I needed to find alternatives things for this behavior. Therefore, I had to change my view of food. I began to look at the benefits of what I was eating, and just not eating to be eating because I was stressed, sad, mad, etc. I followed the guidelines that were given to me by the Fitness on Fire Program’s nutritionist, NutritionistGuru. which required me to make healthier food choices. I would not be honest if I said it was easy, but I asked God to continually give me strength to stay faithful to the process. I enjoy food, but I had to learn how to eat for nutrition and eat those things that benefited me physically. I mainly cut off fast foods, sweets, red meat, sodas and many other unhealthy foods. I began to incorporate more lean protein, healthy carbs, fruits and vegetables. Of course, I make sure to get a minimum of 80 oz of water daily. In the beginning, my workout mainly consisted of one hour of resistance and HIIT training as recommended by my online trainer, King of the Fire. I would work out at least 5 times a week. Now, I have maintained working out 5 times a week, but my workout time has increased to an hour and a half to two hours of exercise. I continue to follow the guidance of my trainer, who guides me on what I should and shouldn’t be doing in order to get the maximum results. I started this journey on January 19, 2017 and I began seeing major results after about 3 months. After I began seeing results, I was motivated to continue because it showed me that I could do this. My complete transformation is not done yet because I am still working on it. What I once viewed as an avenue to just drop a few pounds has become a lifestyle. I still have work to do and I will get it done. Giving up is definitely not an option. I’ve come too far. 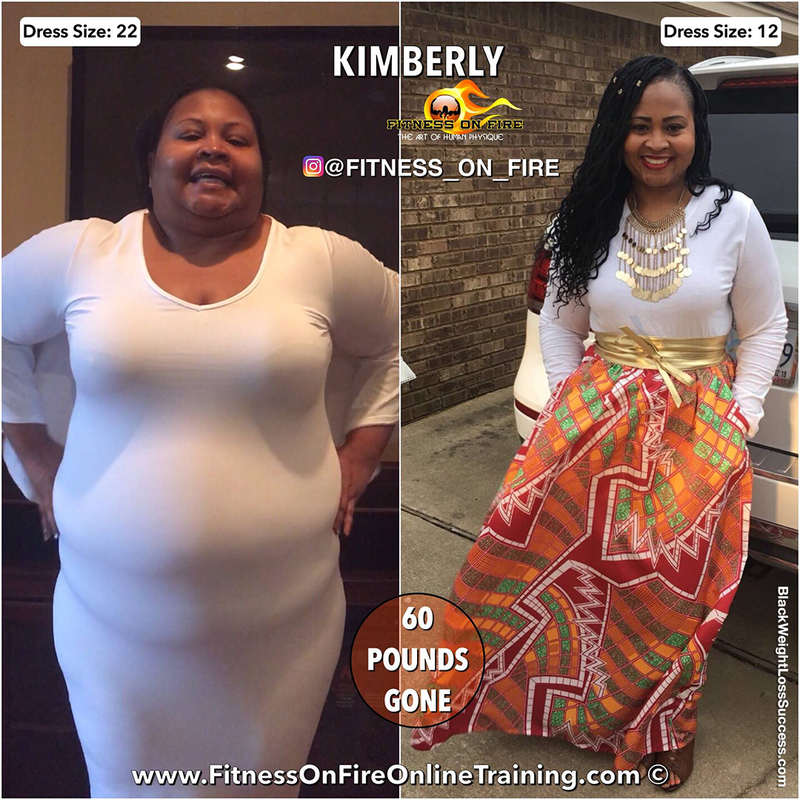 The Fitness on Fire program worked for me because of the accountability that the program has. What made me fall in love with the program was the support that was rendered by both my nutritionist and my trainer. These two components almost guarantee success if you are willing to put in the work and follow the plan. The advice I would give others is to find your triggers so you can identify what may hinder you from being successful. You also have to realize that this is a lifetime commitment therefore you should understand it will take time, effort, and sacrifice. You should never compare your journey to anyone’s else because everyone is different. Also remember there will be times where you might not do everything perfectly but the key is getting back on track and not beating yourself up for it , everyday is a new day and presents an opportunity to start over and you have the freedom to reset as many times as needed but just NEVER give up. You are definitely worth it. I would also encourage people to have at least one person that holds you accountable and most importantly supports and encourages you. And last but definitely the most important piece of advice I can give is to seek God and ask Him for the strength and endurance to stay the course.